Although the Vivian Girls took their Arthurian mademoiselle moniker from outsider artist Henry Darger’s protracted novel regarding a gang of sisters fighting evil, they’d much rather battle it out instrumentally onstage then confront any mischievous wrongdoers. Guitarist Cassie Ramone and bassist Kickball Katy, two youthful Ridgewood, New Jersey natives now residing in neoteric music haven, Brooklyn, have impressed sundry college age fans as well as a few recognizable underground bands with their shambolic musings. Along with founding drummer Frankie Rose, who recently departed to join similarly bare-boned local outfit Crystal Stilts, the Vivian Girls have further enlightened an already fertile Williamsburg scene happening just across the Hudson River east of Manhattan. On their garage-molded 10-song 21-minute self-titled debut EP for In The Red Records, the Vivian Girls show off a wonderfully amateurish adolescent enthusiasm, keeping song ideas short, simple, and sassy. Murkily monotone vocals barely peak above jangling guitar, over-modulated bass, and rudimentary drums. Primal cellar-dwelling production provides the proper archaic setting for each crudely drafted do-it-yourself tune. At times, the Vivian Girls beg comparisons to ‘80s twee pop lynchpins, the Pastels, or sound like cutesy cuddle-core courtesans courting Calvin Johnson’s boutique K Records. Saccharine rockabilly-derived lullaby “Where Do You Run To” best distills the unprepossessing girlie trio’s pale emotional vivaciousness. Yet more often, the revivified grunge-suffused riot grrl influence of Bratmobile or Bikini Kill seems aptly forthright. Then again, going way beyond conventionality and into tousled peculiarity, they recall freakishly dorky late-‘60s minimalists, the Shaggs, when rendering cymbal-slashed bass-ruptured 104-second cacophony “My Baby Wants Me Dead” during a YouTube-clipped Vancouver show. Presently, the Vivian Girls (rounded out by Katy’s college pal, Ali Koehler), are brainstorming ideas for a full-length disc to be initiated, March ’09, with waggish indie pop bellwether Steve Mc Donald (of Redd Kross fame) at the helm as producer. Here’s hoping they retain the same unsophisticated charm that got ‘em where they are now – opening for fellow hotshot Jerseyites the Feelies and Yo La Tengo, New Years Eve, at Montclair’s newly refurbished Wellmont Theatre. How’d the Vivian Girls come into fruition? CASSIE: Me and Katy were best friends who went to high school together. When I moved to Brooklyn, I met Frankie, hung out in her loft with loads of people, and one day, at brunch, Frankie inquired about starting a band. I got Katy to join, but in July ’08 Frankie left (to join Crystal Stilts). Ali Koehler promptly joined. I liked emo – the Get Up Kids, Braid, Cap N’ Jazz, Saves The Day. Also, indie rock like Pavement. I was bored as a kid and listened to whatever I got my hands on. Katy listened to early punks, the Germs, and the Yeah Yeah Yeahs. But when we started the band, we were fully into the Wipers, Ramones, Dead Moon, and the Descendents. Those influences don’t show up on your debut EP as much as more obvious ones such as the Beat Happening or Thee Headcoats, maybe even Sleater-Kinney or X Ray Spex. That’s funny. Everybody says we sound a certain way outside of our influences. But those were our guiding lights nonetheless. How do you usually construct the songs? A lot of our songs, I write guitar parts and words simultaneously. I bring them to the band, who add parts and flesh out the songs with me. Other songs may start with a bass line Katy brings in. So we’ll work off that and compose a song together. I think what we care about most is song structure. We try not to mess around with that. We’re not the best musicians or best singers. We can’t get a complete sound experience at our disposal, so we spend time arranging songs properly. 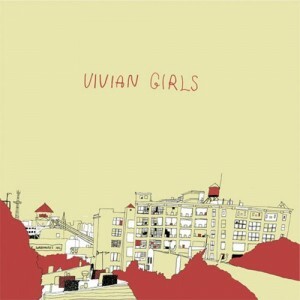 You did the cover design for the Vivian Girls inaugural EP. Do you have an interest in visual arts? I was an illustration major at Pratt. I’m mainly interested in drawing. That’s my artistic forte. I like pen and ink and pencil drawings. That drawing on the cover is actually an art project done for senior class. I was hanging out with Frankie and Katy showing schoolwork. Frankie liked the drawing so we used it. Was the recording done lo-fi because you couldn’t afford a proper studio? I don’t think our music would work if it was overly produced. We’re fans of lo-fi sound. We recorded the debut for $900, which was all we could save to make a record. So we had to do it quickly. Will future recordings be done in a bigger room where voices could be brought up-front? Or are you afraid you’d lose some of that unique primal feel? We’re gonna try to stay raw. We still wanna use a lot of reverb in the foreseeable future. Our sound will pretty much stay the same. 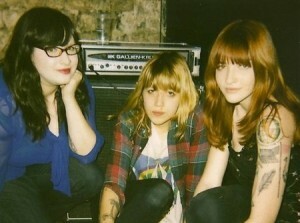 Is “No” the first song the Vivian Girls ever recorded? It’s so skeletal and unadorned and seems like it was done in one take. Will you keep making short, sweet tunes or will you expand the arrangements? I think the main problem with long songs is they overstay their welcome. A lot of ‘em get redundant for the sake of length. We don’t want you to get bored with a song. If you like one, you’ll quickly play it again. (laughter) Someday, if we could write a song that’s interesting for five minutes, we will. As a band, do twee pop lynchpins such as Belle & Sebastian affect the soft-toned jingles? Well. We don’t really draw any influences from twee. I think Belle & Sebastian’s songs are pretty cool, but maybe a bit wimpy. To defer, I’d say Belle & Sebastian’s music is artful whereas yours is artless. Out of all those types of bands, I think the Beat Happening’s real cool. But I don’t think those bands directly inspire us. Many times, your group harmonies are reminiscent of legendary ‘60s girl group, the Shangri-La’s. Thank you. They’re probably my favorite girl group. Yuck! Tiffany’s pre-teen novelty version lacked the sexual immediacy of the Shondells original. It’s like most virginal contemporary pop fabricated for compromised radio stations’ boring playlists. I usually listen to CBS-FM oldies. But they’re stuck on Christmas tunes already. I understand doing an all-Christmas playlist a week before the holiday, but in November it’s overkill unless it’s once an hour.